Need a new SUV that stands out from the rest? Buy or lease a 2019 Toyota RAV4! The 2019 RAV4 is built for weekend road trips, adventures and morning commutes alike. The new RAV4 mpg ratings and specs make the 2019 RAV4 a fuel-efficient Toyota, and the 2019 RAV4 interior features and technologies make this Toyota ideal for modern families. This 5-passenger Toyota SUV truly has it all, so come compare the 2019 Toyota RAV4 to the 2019 Honda CR-V, 2019 Chevy Equinox and 2019 Subaru Forester at our Toyota dealership near Normal, IL. We’ll show you why other SUVs including Ford, Jeep and Honda models can’t compare to the new RAV4! Say goodbye to constant fill-ups when you lease or finance a 2019 Toyota RAV4. The new RAV4 can return up to 35 highway mpg,* outlasting both the 2019 Honda CR-V and 2019 Subaru Forester on Illinois roads. The 2019 Toyota RAV4 also offers the most standard horsepower out of comparable Honda, Chevy and Subaru SUVs to help you accelerate around every bend. Inside the Toyota RAV4 interior, you’ll find a host of cutting-edge technologies like an Entune™ 3.0 Audio system that comes standard with Apple CarPlay™ for your enjoyment. You can control your favorite music and playlists using Siri® Eyes Free, which can’t be found on the new Honda CR-V, Chevy Equinox or Subaru Forester SUVs. You can even pull onto new roads with confidence knowing that standard Toyota Safety Sense™ 2.0 and the Star Safety System™ have you covered. The 2019 Toyota RAV4 is the only 5-passenger SUV listed below to come standard with Road Sign Assist, and it comes standard with Lane Departure Alert with Steering Assist and a Pre-Collision System with Pedestrian Detection, too. The new Toyota RAV4 is the 5-passenger SUV that drivers from Normal, IL, need and adore. 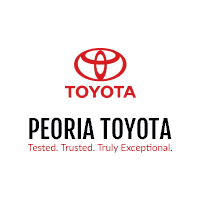 Visit Peoria Toyota to learn more about the 2019 RAV4 price, colors and dimensions and see why you should buy or lease a new Toyota RAV4 over competitors from Ford, Jeep, Chevy and more!